Just the Right Size: March 9th is National Meatball Day! Happy National Meatball Day everyone! Did you even know that today was National Meatball Day? Me neither, LOL! 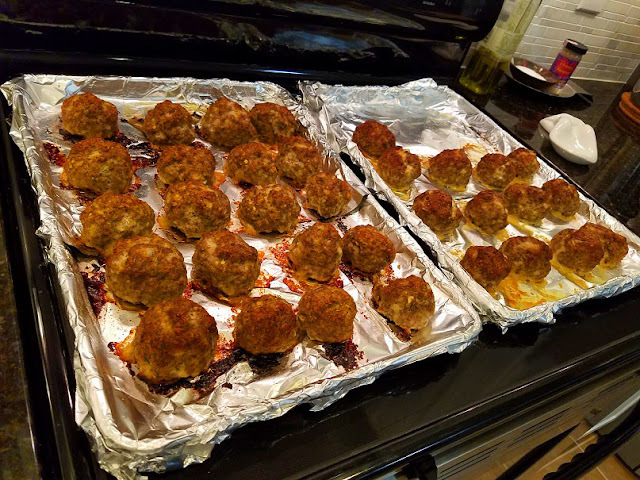 I just happened to hear someone mention it on the radio a day or two ago, and I actually made meatballs this week, so it is with pure synchronicity that I bring you this recipe. This makes a lot of meatballs. I usually freeze the remainders and they are good to use in so many ways: meatball sandwiches, with spaghetti and sauce, crumbled up and used in meat sauce, lasagnas, or really in any instance where you need a meatball or cooked, ground meat. Oh, and BTW, can you even say the word "meatball" without saying it as MEAT-AH-BALL? The recipe is very forgiving and feel free to add or take away spices and seasonings if you want. I add some chili flakes to kick-it-up-a-notch, but if you don't want them, leave them out! Preheat oven to 425°. Mix all ingredients except ground beef in a large bowl, then add ground beef. Incorporate beef well with other ingredients using either a Kitchen-aid mixer (paddle attachment) or your hands. Either spray 2 large cookie sheets with nonstick cooking spray or use nonstick aluminum foil. Roll meatball mixture into balls about the size of an apricot. Place on cookie sheet without crowding. Bake meatballs 18-20 minutes, or just until they are cooked through. Don't over cook or they will be dry.